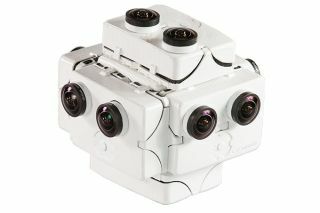 SpaceVR aims to send its "Overview One" camera to the International Space Station to provide 3D, 360-degree views from the orbiting lab. Update for Sept. 15: SpaceVR has launched a new Kickstarter campaign to fund its "Overview One" project. You can learn more about it here. SAN FRANCISCO -- A new crowdfunding campaign aims to raise enough money to put a virtual-reality camera aboard the International Space Station. San Francisco-based company SpaceVR launched a Kickstarter campaign today (Aug. 10) to help fund its high-definition camera, known as "Overview One." SpaceVR plans to launch Overview One to the International Space Station and thereby provide 360-degree 3D views to users back on Earth from the orbiting lab's large-windowed Cupola module. "Our project gives everyone the opportunity to become an astronaut and to realistically experience seeing the Earth in its entirety — recognizing its preciousness and fragility in our universe," Holmes added. "It is our goal to offer this experience to anyone through every virtual-reality platform." The 30-day Kickstarter campaign, which runs through Sept. 9, aims to raise $500,000. SpaceVR will use the money to cover launch costs and the first year of Overview One's operation, company representatives said. For Overview One, SpaceVR is partnering with Nanoracks, a company that helps commercial customers make use of the International Space Station (ISS), and space manufacturing startup Made in Space. Made in Space built the orbiting lab's 3D printer, and the company will use a follow-on commercial machine to manufacture Overview One's camera casing, SpaceVR representatives said. SpaceVR is targeting late 2015 for Overview One's launch. Once the camera is up and running, it will stream live footage back to virtual-reality headsets in museums, classrooms and people's homes, company representatives said. "When I traveled on the ISS and looked at Earth, my conception of the scale of our planet went from unimaginably large to absolutely finite and, in fact, small," SpaceVR board member Richard Garriott, a video game developer who visited the orbiting lab on his own dime in 2008, said in the same statement. "I later learned that this sensation is common among those who have been to space, and is known as the 'overview effect,'" Garriott added. "We would all benefit if we had a shared experience of this kind. I am excited to see SpaceVR launch its Kickstarter project and take the first steps to making this happen." SpaceVR's ambitions don't end in Earth orbit. The company also hopes to send one virtual-reality camera to the moon in 2017, another to an asteroid in 2022 and a third to Mars, perhaps as early as 2026, company representatives said.